As we near the 75th anniversary of World War ll in Europe, my memories of that time are sharper than ever. Don't ask me what I had for breakfast three days ago, or about the weather last weekend, but when it comes to the war on Britain's home-front I am as clear as a freshly washed window. I REMEMBER September 3, 1939, a warm sunny Sunday morning, when we learned we were at war. Huddled around the wireless with me in the tiny front room of our house on England's south-east coast, we were seven: four of my sisters, along with our parents and cat called Clarabelle who sensed the importance of the occasion. All was quiet, other than the ticking of a clock on the tiled mantelpiece, and the drone of small aircraft from a local aerodrome. Then came the 11 a.m. announcement by Prime Minister Neville Chamberlain: German soldiers had marched into Poland, resulting in our declaration of war. I was nine at the time, the youngest of seven daughters. I REMEMBER another Sunday morning almost a year later, when my 11 years' old sister Iris and I were sent to the countryside to live with strangers. There was little time for preparations, or to get used to the idea. Two days earlier a letter brought home from school announced its closure, while urging parents to send their school-aged children to safety through a government programme called Operation Pied Piper. It sounded simple enough. All we had to do was turn up at our school on the Sunday morning, each of us with a single bag and a label stating our name and address attached to outer clothing. My belongings were stuffed into a burlap sandbag. The identification label around my neck was tied on a rough string. From there, children and teachers would be whisked away on busses and trains to safer locations. Pre-schoolers could come too, if accompanied by an older sibling or parent. During our walk to the school this fateful Sunday morning, we passed several three and four year olds clinging to sisters or brothers who weren't much older. Nobody was told where we were going. In my blazer pocket I carried a stamped addressed postcard which, upon my arrival, would be mailed to my parents telling them where we had landed. In these days of instant information it seems inconceivable that this was the only means of communication. 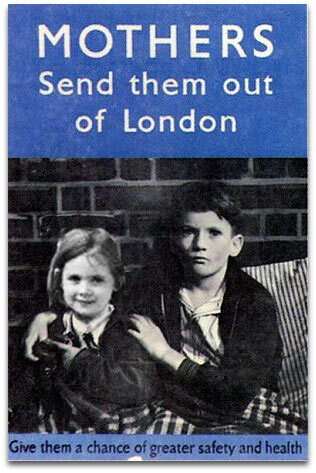 At the outset of war, more than a million youngsters had been sent from London and other industrial cities to what were considered safer parts of Britain. Now, with enemy-occupied France just sixty miles from our coastal home, invasion appeared imminent, and in June 1940 some 20,000 from our immediate area were evacuated. I REMEMBER apprehension mingling with excitement during the long ride north. I had never been this far from home. Now our train huffed and wheezed through a patchwork of fields housing neat farms with sleek horses and fat sheep under enormous trees. Families living alongside the tracks came into their gardens to wave and cheer us on. Some women were crying, and I didn't know why. 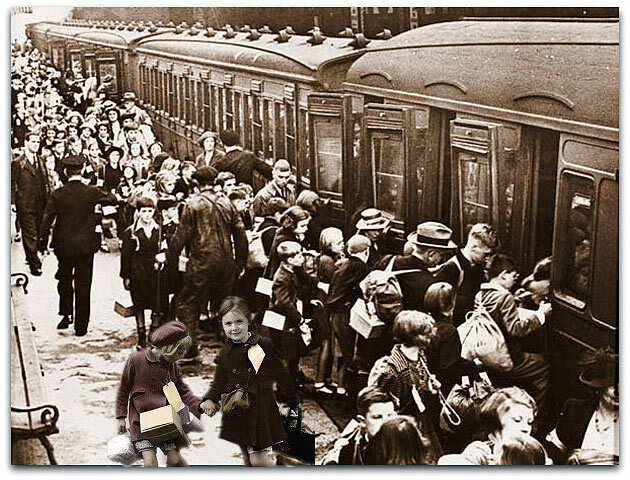 In late afternoon our train stopped often in Derbyshire to unload a dozen or so children who then boarded busses to outlying villages. I REMEMBER sitting on a hard little chair in a one-room school, feeling tired and grubby, and flushed with the humiliation of being one of the last to be chosen by prospective foster parents. Then, just as I thought Iris and I might be sent back home, Cissy and Joe Simpson came in and asked my sister if she would like to live with them. A middle-aged couple set in their ways, they had no children of their own. Probably the last thing they wanted was a young girl in their home, and yet they took us both. It was only after the war that I realized the extent of their generosity. I REMEMBER the beauty of Derbyshire where, during the next two years, I lived in four different billets in three communities. Rushing to mind now are wide open spaces where delicate wild flowers grew in Spring, and in winter we played rosy-cheeked in deep fluffy snow. The smell of Cissy's home baking, farm animals, newly cut hay. The abundance of food, the absolute peace, getting to understand dialects so different from ours in Essex. Anxiety too, upon hearing that our home town had been bombed, and not knowing whether my family had survived. Letters and parcels from home. In my first three billets I was treated like family. In the fourth I learned what it was like to be unwanted, hungry, cold and miserable. I REMEMBER the joy at learning our entire school would be returning home, and the disappointment upon arriving home to find everything changed. No longer a happy, noisy, place, our house was bleak and eerily quiet. My sisters were away, or worked such long hours I rarely saw them. Now I joined my mother in endless queues for just about everything. We dug up our flower garden and replanted with vegetables. My mother, a Londoner who knew nothing of chickens, raised hens in the back yard. Our neighbours kept rabbits in tiny hutches. Posters screamed at us to Make Do and Mend. And we did, creating jackets from coats, using wool from tatty jumpers to knit warm socks and scarves. Old curtains saw a second life as skirts and dresses. Parachute silk made flimsy underwear when my sister brought some home from her factory. We ate meatless stews, fake eggs and grey bread and sausages that appeared to be made from sawdust. I REMEMBER my stomach churning when the air raid siren sounded, the sweat and trembling as German bombers flew overhead. The dread of a full moon which brought them in droves. The sharp cracks of fire from mobile guns on our street. The bomb that killed our neighbour, shattered our windows and sent our front door half-way up the stairs. The buzz-bombs chugging overhead, and our instructions to run in the opposite direction of their path if the engine cut out. The deadly rockets, so fast nobody could run from them. The dank odour of our garden shelter, to which Mum and I retreated night after night because I was frightened of the air raids. I REMEMBER the day we burned our black-out screens, and the ringing of church bells announcing the end of the war in Europe. It was May 7, 1945. Our street party raised little cheer because we still had loved ones at war. Next came the horror of seeing skeletal inmates of a German internment camp, in photographs brought home by my sister from Bergen-Belsen. Witnessing first-hand the terrible destruction of East London where my grandmother lived in one room of her bombed home. And in our local cinema, watching unbelievable devastation from an atomic bomb dropped on Hiroshima. It killed close to 80,000 people that day. A second bomb hit Nagasaki three days later. Although the war was over, in Britain shortages continued for years. We had no coal to heat our houses. Food was rationed or non-existent. There was a desperate lack of housing, unemployment was rampant, families torn apart. Fellow evacuees I have spoken to, and read about, agree they were permanently affected by their war experience. Like returning soldiers we found we didn't fit in. Our parents had become strangers. Siblings home from the fighting were not content to settle into mundane routines. Many marriages couldn't survive the absence of a partner for six long years. Women had discovered independence. These days there are counsellors helping with post-war trauma of people returning from battle. After our last all-clear, we had to muddle though as best we could. Pam and fellow evacuee Sheila Overton in fancy dress.